We're always hearing politicians talk about our crumbling infrastructure. It's a very important matter, because we don't want to be going over a mile long bridge and have it suddenly collapse. Because a mile is way too long to gun it and hope to make it the rest of the way. We hear them talking about it, but I never hear of anything getting done. This weighs on my mind, no matter where I am. Like today, I was over at one of our major parks, and I'm sitting there under the shelter, thinking it might collapse at any minute. I spent my time doing some investigating, and what I saw was pretty bad. I seriously believe our infrastructure is crumbling, and someone ought to do something about it before it's too late. Everyone might say a shelter house at a local park is just a miniscule part of our infrastructure, which I admit is true. But of course there's a good principle to bear in mind: If we're not taking care of the little things, what makes you think we're looking after the big things? What I saw, to me was shocking, and I don't shock easily. To prove it, I have a number of fetishes that would curdle your hair, everything from lizards to lingerie, so obviously I don't shock easily. It all started today when I was sitting at a picnic table and looked down. And what do I see? Rust! There was rust near one of the bolts holding the table together! It might have collapsed then and there! This led me to look around, and among the things I saw were pieces of random Scotch tape on the tables, cobwebs, dust and dirt, and bird poop. This is a table, people, where people are supposed to eat! By now I'm up and looking around the facility, thinking I've got a scandal right here under my nose. I concluded the place was barely safe enough to sit under, and I estimated it might entirely collapse under its own weight sometime soon. I'm giving it 150 years, tops. Let me get the top illustration out of the way first. 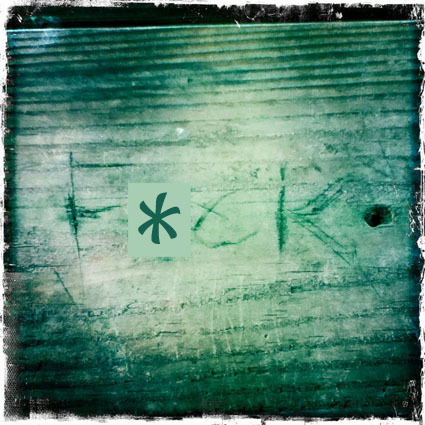 You can see that someone scratched the "F" obscenity in the woodwork. That's on the east side of the structure, and represents something of the shabbiness of the place, if those using it don't think any more of it than that. To me, it's a cry for help, for our elected officials to get off their asses and fix the place up. It's unacceptable. My other illustrations show some of the problems of the place in greater detail. In the top left, we have a loose screw and a split in the wood. That's about to give way. It can't last another 40 years. Top right, nails hanging out and bent over, up by the ceiling. If you're 8 foot tall, that could take an eye out. 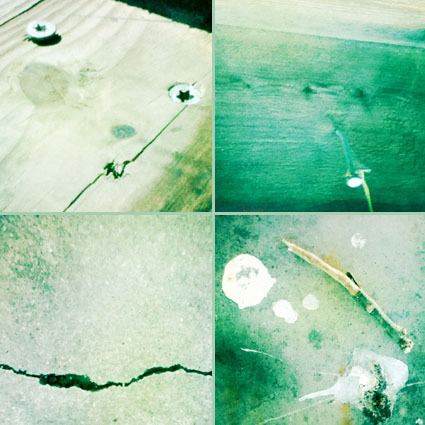 Bottom left, the cement slab where all the tables set has multiples cracks in it. These could open up at once and swallow someone, perhaps an innocent child. Then, bottom right, like I said before, there's bird poop everywhere, and it's disgusting. I put a stick next to it so you could get the scale; this is some big crap. Among the other things I don't show, there are weeds near the facility. And I saw dented garbage cans with their lids not securely on top. They're either hanging loose, or in one case, simply laid on the ground. Anyone could crawl under there and be asphyxiated, and I'd hate it to be an innocent child. When you're driving up, it looks like paradise; it looks very nice. And even walking up to it, you see a pleasant place. It's only when you really look closely that you see the truth, that it's in a state of severe deterioration. It makes me wonder what I would see if I walked around the whole park. The pump for water, does it work, are the pipes rusty? The restrooms, are they clean, do the toilets flush, or is it just putrid blue and brown water with a mountain of yellowish toilet paper looking back at you? The playground equipment, are the chains to the swings rusted? The grills, do they have the dust and grime of past charcoal fires? This, folks, is our crumbling infrastructure, and it's a shame. I have certain recommendations, one, that they should fix it all. And two, if that can't be done, because of budget constraints or whatever, at least they should put some wood glue in the splits and clamp them together for a couple days. If not for ourselves, then for future generations.